Kettle joined Leeds City as a Junior and the nineteen-year-old Schoolboy International made his City debut at Outside Left in April 1918 in the Subsidiary Tournament game at Bradford Park Avenue, which City won 2-1. It was to be his only game for City and despite all his unfulfilled promise he went back to his native South Shields before later joining First Division Newcastle United in 1919, but did not make the first team. He then joined Non-League Ebbw Vale before joining Third Division South Southend United in 1921 and he scored once in thirty-one League games and once in two F.A. Cup ties. 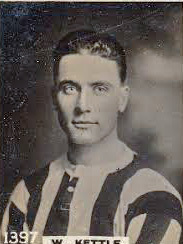 He joined Third Division North Grimsby Town in 1922 and scored three times in sixteen League games. He stayed in the Third Division North Competition and joined Southport in 1923, where he scored once in eighteen League games and also played four games in the F.A. Cup. He stayed in the Third Division North Competition when he moved to Wigan Borough in 1923 and stayed there for three seasons before retiring at the end of the 1925-26 season after scoring thirteen goals in thirty-nine League appearances and figuring in three F.A. Cup matches. He died in 1980.